The man crowned as America's first black president for his unprecedented personal connection to the African-American community has abdicated the throne. By injecting himself into the Democratic primary campaign with a series of inflammatory and negative statements, Bill Clinton may have helped his wife's presidential hopes in the long term but at the cost of his reputation with a group of voters that have long been one of his strongest bases of political support. Illinois Senator Barack Obama won an overwhelming victory in South Carolina with the support of African American voters who made up 53 percent of the vote, according to CBS News exit polls. Eighty percent of those voters chose Obama. The rout came after weeks of racial polarization, much of it involving the former president, who thrust himself into the fray in a manner more reminiscent of backwoods Arkansas politicking than conduct befitting a former commander in chief. 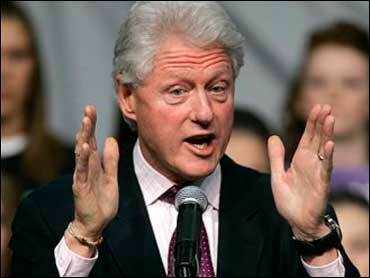 Bill Clinton was once seen as a big asset for his wife's campaign, especially among Democrats. After the thrashing Hillary Clinton took in South Carolina, the former president may find himself in the doghouse, if not the bullpen. It was one phrase that began the racial ball rolling. When Bill Clinton referred to Obama's claims of consistent opposition to the war in Iraq as "the biggest fairy tale that I have ever seen," many blacks heard more than policy criticism. They heard a dismissive attack on the first black with a real chance of winning the White House. They heard echoes of racial battles of the past. And they heard it from someone who was supposed to be on their side. Bill Clinton has not been the only campaign surrogate to stoke the racial fires. References by at least two Clinton supporters about Obama's past drug use, including a comment from one of the wealthiest African-American businessmen in the country. E-mails have surfaced, some traced to Clinton campaign volunteers in Iowa, claiming that Obama is a Muslim. Former Senator Bob Kerrey, on the day he announced his support for Clinton, made sure to make a point about how wonderful he thought it was that Obama's middle name is Hussein. A radio ad in South Carolina sought to portray Obama as a fan of Republican policies in the 1990s. The candidate herself contributed to the furor when she intimated that while Martin Luther King Jr. was a wonderful leader, it took President Johnson to make the Civil Rights Act a reality. But it has been Bill Clinton who carried the campaign's attacks in the wake of his wife's Iowa loss. The "fairy tale" comment was followed by the claim that he had personally witnessed attempts at suppressing votes (a topic that touches blacks on a personal level) in Nevada by Obama supporters. It was Bill Clinton left to carry the ball in South Carolina for most of last week, while the candidate was in Super Tuesday battlegrounds like California. When confronted with the rhetoric, Clinton lashed out at the media - and his wife's opponents. "I never heard a word of public complaint when Mr. Obama said Hillary is not truthful about character," he told reporters last week. "When he put out a hit job on me at the same time he called Hillary the senator from Punjab. I never said a word." South Carolina Rep. Jim Clyburn, the highest ranking African American in Congress, publicly told Bill Clinton to "chill a little bit." Atlanta Mayor Shirley Franklin, speaking with the former president just feet away, rebuked his language, insisting, "this is reality, not fantasy or fairy tales." The shots came from all corners. Writing on his own blog, Clinton's former Labor Secretary, Robert Reich accused Clinton of spearheading a "smear campaign against Obama." South Carolina voters apparently agreed. The numbers are jarring: Fifty-eight percent said Bill Clinton's involvement was important to their decision and most of them voted for Obama. Seventy percent believed Hillary Clinton had unfairly attacked Obama. As a warning to Clinton, just 77 percent said they would be satisfied with her as the nominee. "Not presidential" is how former Senate Majority Leader Tom Daschle described Bill Clinton's behavior on the campaign trail of late. All the same, it may be effective. Clinton's campaign is aimed at capturing voters who make up a huge part of the Democratic demographic: Middle class, white, female, older. Those are the voters who may shy away from backing a "black" candidate, as they have in earlier contests in this race. Despite his huge margin of victory, Obama captured just a quarter of white voters. And the nasty tactics had another purpose - to knock the candidate of "hope" off the mountaintop and down into the gutters of hardball politics. Forcing the man who has sought to connect himself to the legacy of inspirational leaders of the nation's past (he announced his candidacy in the shadow of Abraham Lincoln) to trade blows and accusations with Bill Clinton on the divisive issue of race only serves to muddy both. And there's some evidence that it worked. Fifty-eight percent of South Carolina voters said they felt Obama unfairly attacked Clinton during the campaign. Should Clinton win the nomination by marginalizing Obama as a black candidate, she may well end up in the White House. The sign outside should read: Still wanted, the first black president.